Everyone loves a Dachshund! Now you can sew a sweet pair of Sausage Dog siblings. The pattern includes Dixie with her tail down. 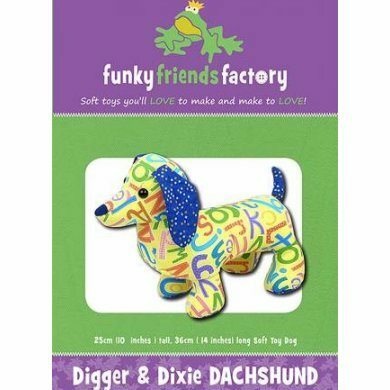 Her brother Digger has a cute upright ‘puppy’ tail which you’ll see waving around in the air whenever he digs up the garden beds! The Dachshunds can be sewn in most fabrics. I sewed them out of quilting cottons but stretch fabrics like fleece or minky would be nice and snuggly!